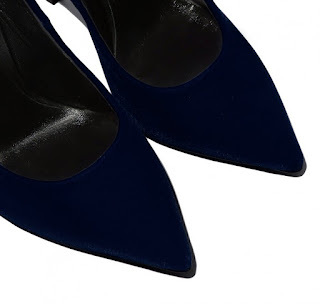 Glowy: Shoe Of The Day: Casadei Blade blu Gotham velvet Pumps. 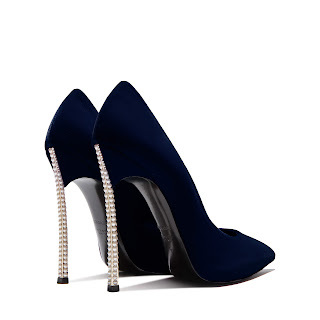 Shoe Of The Day: Casadei Blade blu Gotham velvet Pumps. Immediately i saw this shoe, i was teleported to another world entirely and was have a shoegasm moment that i so didnt want to come back any time soon.. oh my gosh these shoe is making me emotional right now. How can one shoe have all these cutness overload in it? Related: Check out other blade designs we've talked about. The uber-chic look of this sophisticated evening pump in deep blu Gotham velvet, presents the iconic ‘Blade’ heel covered with luxrous faux pearls. The shoe features a blue velvet upper, and a 115 mm / 4.5 inches with a 10 mm / 0.4 inches concealed plateau Blade' heel in real steel. You can purcase this shoe here for $850. Labels: Blade Pumps, Casadei, Designer, shoe of the day. That is without a doubt a stunning and elegant pair of shoes but the price...holy cow! I need to save up for a couple of years for it. Cuteness overload for real. I need it in my life. All hail dz leg bomb baby!